Fueltek FMO (FUEL MANAGER ONLINE) is part of a new generation of products. Online is the operative word. Fueltek FMO software is a web browser based application. This means that information can be easily accessed, by authorised users, from any location. All that is required is an Internet or connection, an account number, a login and a password. Users can review and print reports, export data to other software packages, update information, monitor fuel stocks, view vehicle performance, monitor CO2 emissions, add or lock out users from the system and perform many other key tasks. Levels of access can be controlled by an administrator function that introduces users to the system, the user profile created dictates’ how much or how little information and control is available to individual users. Good management is based on sound and timely information so Fueltek FMO has been engineered to be truly accessible. Whether the manager is based at HQ, running a depot or travelling in the UK or overseas they can easily access information and make decisions. An application is even available for your smartphone if desired. 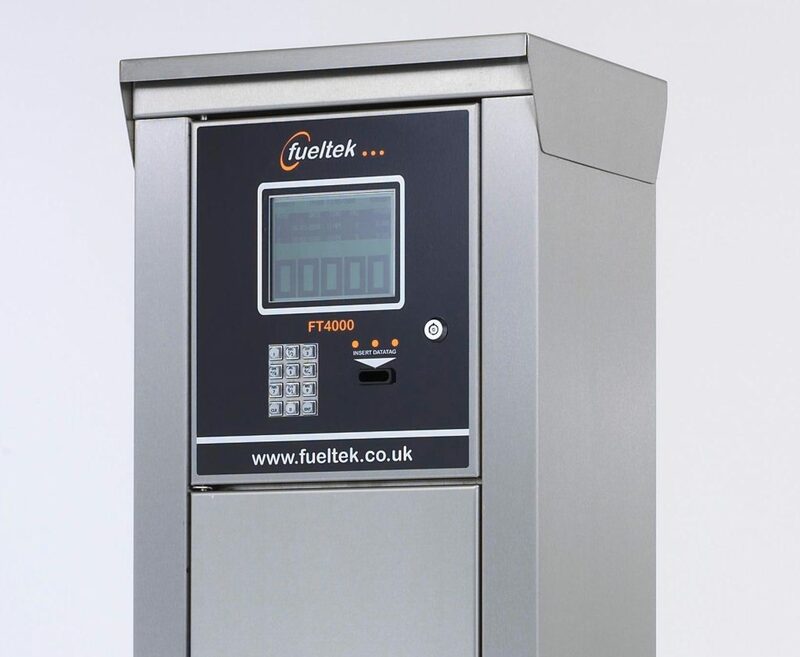 The software works with Fueltek’s FT4000 Fuel Access Control Terminal (FACT) which acts a data capture unit, monitors access to the pump and measures pump throughput. The FACT is given an Internet protocol (IP) address. Communication between the FACT and host PC is usually done through the World Wide Web. Data on fuelling transactions, fuel stock levels and vehicle mileage is securely transferred and only accessible to authorised personnel. Managers can customise reports so that any activity that is outside the norm is highlighted and can be investigated further. For example, MPG exceptions can be reported on. The system can warn when fuel levels fall to a designated re-order position, the system can detect fuel deliveries and any movements outside pre-set parameters, this information can be emailed or texted immediately to relevant personnel. Vehicle warnings such as MOT due, Tax Due, Service due etc can be reported on or generated as warnings in a number of formats. Fueltek FMO is also the interface with the company’s Tankwatch system, an innovative product that monitors and controls fuel storage tank contents. Traditionally fuel management systems have relied solely on Book stock readings which form the basis of costing the fuel usage, the figures are often misleading because the readings are based on pump throughput, if the pump is inaccurate the inaccuracy is passed directly to the book stock reading. Pump inaccuracies are also cumulative so even if the pump is accurate and calibrated to an acceptable +/- 0.5% the book stock will still drift to half a per cent of the volume of fuel used, this could amount to as much as 5,000 ltrs for every million litres used, more if the pump is not calibrated. Tankwatch enables managers to address this problem by monitoring the actual contents of the fuel tank. Tank watch is accurate to approximately 0.33 % which is constant no matter how much fuel is put through the fuel pump. Tankwatch is a fully integrated part of the Fueltek fuel management system and provides valuable information on the actual contents of your fuel tank, the accuracy on your fuel pump, which allows you to take action and have the pump serviced and re-calibrated if necessary. Tankwatch also automatically detects deliveries and warns the operator a delivery has taken place, this is particularly useful on multiple site operations where remote site tank stock information is usually difficult or in some cases impossible to manage. Tankwatch will also stop theft directly from the fuel storage tank by providing timely warnings via text if the stock levels drop below a pre-determined level unexpectedly. All Tankwatch reporting is done through Fueltek FMO. FUELTEK FMO has applications in passenger transport, freight, haulage and logistics, manufacturing, local authorities, emergency services and other organisations that operate vehicle fleets. The software is equally useful in single site operations with a handful of vehicles as it is for large organisations that have hundreds of vehicles and scores of locations. FMO is easy to install and set up. It can be hosted by Fueltek and made accessible to the end user without any components being installed on the end users system. This off site hosting reduces any IT overheads to clients and also frees their systems for other tasks making them faster and more reliable.